Support South Carolina Maritime Museum just by shopping. When you shop at smile.amazon.com, Amazon donates. 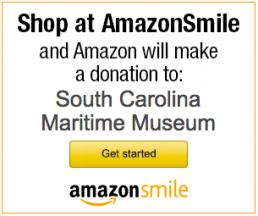 Amazon will donate 0.5% of the price of your eligible AmazonSmile purchases to South Carolina Maritime Museum whenever you shop on AmazonSmile. Purchases Eligible for Donations – Tens of millions of products on AmazonSmile are eligible for donations. You will see eligible products marked “Eligible for AmazonSmile donation” on their product detail pages. Managing your AmazonSmile Account – You can use your existing Amazon.com account on AmazonSmile if you have one, or create a new account if you don’t. Harbor Historical Association (HHA) – HHA is the 501 (c)3 organization for the South Carolina Maritime Museum.